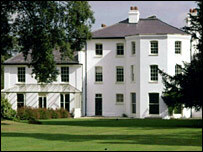 Charles Darwin's former home in Bromley, south-east London, has been nominated as a World Heritage Site. Down House at Downe was Darwin's home for 40 years and where he developed his revolutionary theory of evolution. The property also includes the scientist's experimental garden where he studied plants and animals. Announcing the UK's 2006 nomination, Culture Secretary Tessa Jowell said: "Darwin was one of the greatest scientists of the modern age." Darwin moved to Down House in 1842 following his epic round-the-world trip in the 1830s, which included a visit to the Galapagos islands. The property, now managed by English Heritage, was where Darwin completed his famous work The Origin of Species and a number of follow-up studies. The Origin of Species, which outlines Darwin's theory of evolution by natural selection, is now recognised as one of the most influential books of all time and one which transformed scientific and wider public thinking about natural life and humans' place in the natural world. While World Heritage Sites are usually associated with cultural landmarks like Stonehenge, Ms Jowell said it was also essential to acknowledge scientific discovery. The World Heritage Centre in Paris will consider the nomination and announce its decision in the summer of 2007.